There has been a big kick with cauliflower lately. Roasted cauliflower. Cauliflower “mashed potatoes”. Cauliflower pizza crust. etc. etc. etc. 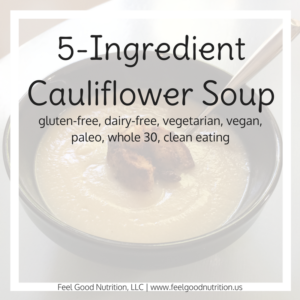 Well you should try my cauliflower soup! I wish I could get Brandon (remember.. the veggie hater) to even give it a try but because he knows the ingredients he won’t even give it a shot. I like to cut up all of the ingredients first so that I can throw them all in the pan at the right time. After the soup cooks for about 20-25 minutes you will need to blend the soup so your cuts don’t have to be beautiful but they should be relatively uniform so that they cook at the same pace. It is not good to have some super mushy and others raw… been there, done that! Heat 1/2 T of the oil of your choice in a heavy pot/dutch oven. For this recipe I would use a mild flavored oil: olive oil, unflavored coconut oil, sunflower oil, rice bran oil, corn oil. Brown garlic and onion in the pot. This process takes about 5-7 minutes. Be careful not to burn them. Browning the onion and garlic gives the soup an additional depth of flavor. Once brown, add broth and chopped cauliflower. I prefer to use my own broth if I have some available but in a pinch I do keep some clean broths on hand. The Progresso brand is not approved for the initial phases of the LEAP diet but is a great clean broth if you are past phase 5 or not following the LEAP diet! After the soup contents are soft add everything to a blender and puree until creamy. I had to do this in batches because my blender is not big enough to hold all of the soup. If you have an immersion blender, this would be the perfect time to use it. When everything is blended pour back into the pot and heat back up to serve! I enjoy croutons with my puree soups so I made some homemade croutons with crusty dutch oven bread. The soup is also great with cut up scallions. 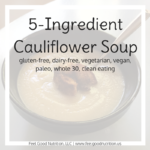 Easy 5 Ingredient Cauliflower Soup that the pickiest of eaters will enjoy! In dutch oven, heat oil over medium heat. Add onion and garlic. Cook until slightly browned, about 5-7 minutes. Add broth and cut up cauliflower. Bring to a boil and cover. 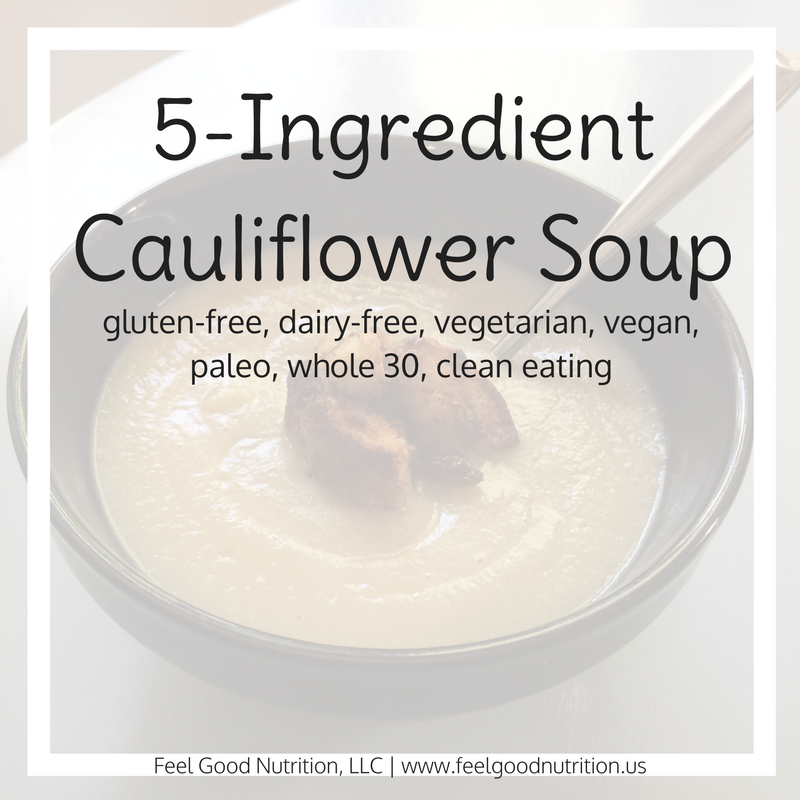 Simmer for 20-25 minutes until cauliflower is softened. In batches, pour contents of pot in blender. Blend until smooth. Continue until whole pot is smooth. Pour each batch back into dutch oven. Add salt and stir. Heat soup and serve with sliced green onions or homemade croutons. What’s your favorite homemade soup?